This week you can stock up on Cat and Dog food at Target. 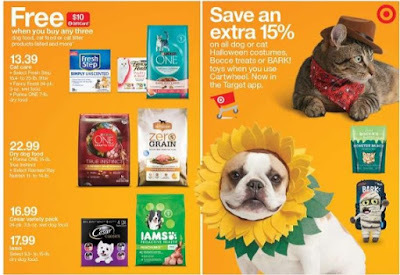 Take advantage of the Free $10 Target GiftCard offer when you buy any three dog food, cat food or cat litter products listed and more. Select Fresh Step 15.4- to 25-lb. litter, Fancy Feast 24-pk. 3-oz. wet food or Purina ONE 7-lb. dry food. Plus this week save an extra 15% on all dog or cat Halloween costumes, Bocce treats or BARK! toys when you use Cartwheel. Now in the Target app.